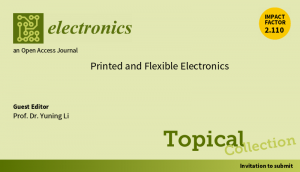 Prof. Yuning Li being the Collection Editor of MDPI Topical Collection “Printed and Flexible Electronics”! Congratulations to Jenner who is being awarded the Institute for Polymer Research (IPR) 2019 Award! Dr. Keqiang He and Dr. Zhong Ma are joining us as postdoctoral fellows in our group! Welcome Dr. Reza Mohammadi to join our group as a visiting scholar from Sharif University of Technology! His research interests include synthesis and characterization of nanomaterials for perovskite and dye-sensitized solar cell applications. We would like to welcome Dr. Liang Wang from Jianghan University, a new visiting scholar to join Prof. Yuning Li’s research group! His research interests include design and synthesis of organic materials for photovoltaic devices. Congratulations to Yinghui He for successfully defending his PhD thesis on 29/8! Welcome Dr. Arthur Hendsbee joining our lab as Postdoctoral Research Fellow! We would like to welcome Dr. Arthur Hendsbee, a new NSERC Postdoctoral Fellow in Prof. Yuning Li’s research group! His research interests include organic electronics and materials chemistry.